Does nothing wrong mean anything right? Classical QFD or Blitz QFD® or Reverse QFD? There are many approaches to QFD, depending on the strategic purpose of your project. Here are a few of the most common ones. For questions, please contact QFD Institute. You have a new capability, solution, or technology to implement. This QFD approach helps you find markets and perfect your solution to the unique needs of those markets. You have a good product, but new markets or competitors are forcing cost/price reduction. This QFD approach helps you identify what can you do more cheaply, what is over-engineered and can be simplified or removed without negatively affecting customer satisfaction. Other companies have added features and functions to their products and your sales force is screaming that you must offer the same. This approach to QFD confirms if the competitive offerings address critical customer needs or are just gimmicky. If critical customer needs are being addressed, how can you do better than copying the competition? If gimmicks, how do you encourage the competition to continue to waste more money on solutions to problems customers do not have? Governmental or industry standards and regulations have changed, or you wish to enter a market where they are different than what you follow today. This QFD approach helps identify what customers' needs are most affected by the regulatory change and must be protected in any redesign. New production equipment, facilities, locations, or workers are to be utilized. This QFD approach helps us identify the impact of operational changes and assure that critical customer needs are not negatively impacted. Your products are experiencing significant market or process failure modes, safety claims, or security vulnerabilities. Improvement processes such as six sigma, kaizen, quality improvement stories, 7D/8D reports, etc. are not delivering significant enough improvement. This approach to QFD examines the environmental and situational sources of these problems, which often involve customer and user behaviors in order to help design more robust products. Your company's products and processes have been in place for decades; those who created them have long retired. You're no longer sure why things are done the way they are done as the handwritten notes and drawings are no longer available. Or, your senior technical staff are approaching retirement and their knowledge must be documented before they leave. This approach to QFD uses the matrices and other charts to capture information about technical and process decisions, and make them available to future staff in an easy-to-follow format. QFD has diverse techniques and tools. The key for success is knowing which ones are best for your specific application, project, and business strategy, as well as using the tools in the correct sequence to maximize their usefulness. It is important to you to see the new project develop in the right direction from the start, and sound Voice of Customer analysis to ensure incorporation of top priority needs should be done before costly, late changes in design and process are required. We recommend learning the current best practices, as drafted in the new ISO 16355, taught in the public QFD Green Belt® and QFD Black Belt® courses. We also invite you to contact us for in-company training, private consultation, and questions you might have about using QFD. Developed by the QFD Institute to address the Four S's (speedy, smart, slim, sustainable) of today's lean business environment, Modern QFD identifies the minimum QFD effort required with the optimum tools and sequence, making QFD more efficient and sustainable in today’s businesses. It has new, rigorous front-end Voice of Customer tools for faster, easier in-depth analysis and upgraded math for meeting the mathematical rigor demanded by six sigma precision. 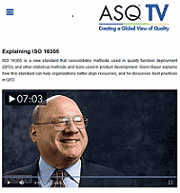 It conforms to the ISO 16355 draft. This technique focuses on "value" discovery and "speed." It is especially valuable in IT and software applications that demand faster, focused product development and legacy risk consideration. This technique is integrated in the QFD Green Belt® training. When your requirements start with specifications provided by the customer (especially in B2B suppliers), or when your Voice of Customer (VOC) data contain explicit product features and specifications and unrevealed customer needs, Reserve QFD technique can first identify key customers and their needs, and then drive "market-in QFD" in order to fine tune the product and create real value. This advanced technique is taught in QFD Black Belt® Course. This expands the system of QFD across the entire organization, encompassing all levels of business functions from top management strategy, project portfolio management, system level design, R&D, detailed design, testing, down to day-to-day operations, ongoing support, and product retirement. This advanced technique is taught in QFD Black Belt® Course. This conforms to the ISO 16355 draft. This optimizes QFD for your organization to improve sustainable staff compliance and long-term benefits. It can be fully integrated with Stage-Gate™, Design for Lean Sigma, Design for Six Sigma, Kansei Engineering (Lifestyle QFD), Hoshin and other innovation methods. This conforms to the ISO 16355 draft. Please contact QFD Institute to inquire.